The "Krilla Krunch" roll: shrimp tempura, unagi slaw, Persian cucumbers, avocado, carrots, masago, tempura crunch and unagi sauce. BLK MKT Eats has barely been in business four months, but already people are asking: When is the second location going to open? The inquiry doesn't just stem from the restaurant's tight environs, though that has something to do with it. 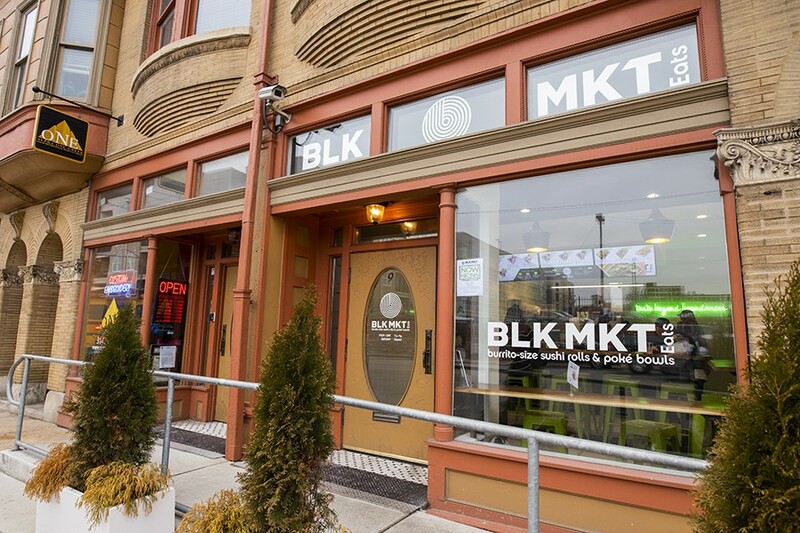 BLK MKT Eats is so popular, it grew out of its small storefront in the Gerhardt Lofts commercial strip near Vandeventer and Forest Park Parkway on its very first day. 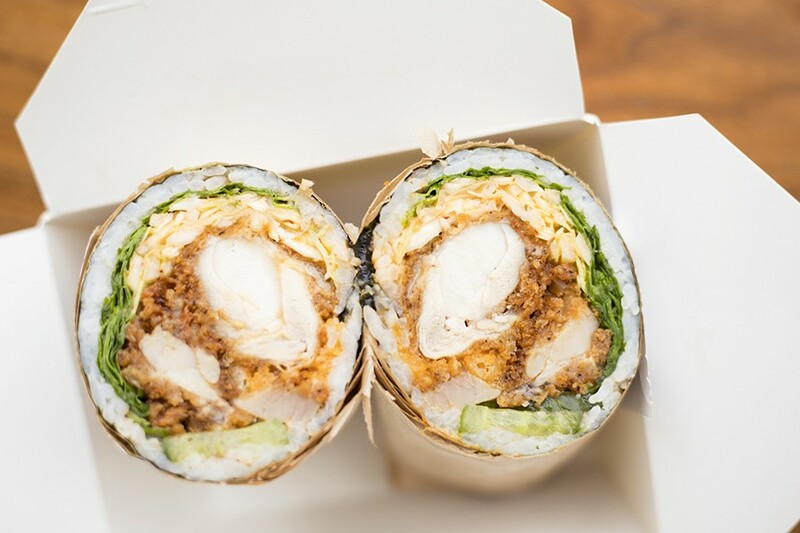 Granted, cousins and co-owners Kati Fahrney and Ron Turigliatto had concocted a scheme to drum up business by giving away their signature sushi burritos to the first 100 customers, but the lines didn't stop that day. They still haven't stopped. However, from the wild-eyed looks on the faces of those who wait in line for a taste of BLK MKT Eats, the restaurant would likely be packed even if the building was the size of the neighboring IKEA. After all, it's the first place in town offering the sushi burrito, a hybrid of the sushi roll and burrito taking the country by storm. Though it's been popular on the East and West coasts for the last few years (Starbucks even launched a version in certain markets last fall), the genre had yet to make its way to town. Owners Ron Turigliatto and Kati Fahrney left teaching jobs to start the restaurant. Fahrney and Turigliatto may have seemed like unlikely culinary trendsetters. Educators by trade — she was a teacher in the Parkway School District, while he taught in the Special School District — they have a passion for food and cooking, often whipping up impressive meals and experimenting in their home kitchens. Though they loved teaching, they both felt ready for a change and sensed a business opportunity in the restaurant industry, particularly in the fresh, fast-casual market. For the cousins, sushi burritos were a natural fit. Avid sushi eaters, they thought the format would be a perfect way to express their love of fresh seafood, vegetable-forward eating and bold international flavors. 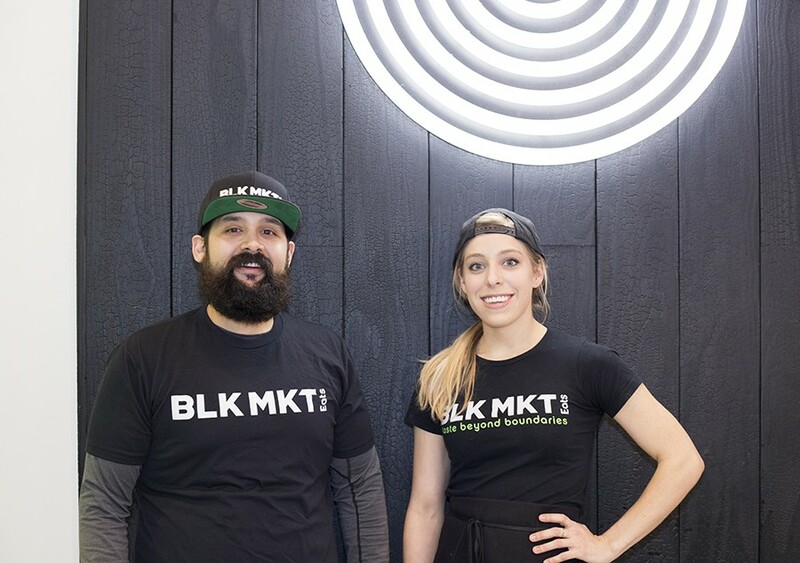 With no professional cooking experience and only limited time spent working in restaurants, they quit their jobs and spent a year developing the food, brand and philosophy that would become BLK MKT Eats. 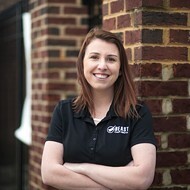 Co-founder Kati Fahrney runs a swiftly moving kitchen. They describe that ethos as being transportive; guests should enter the restaurant and feel like they are in a different place — a club-like atmosphere with the pulsing beats, shiny white walls and green neon lighting of a South Beach hot spot. Like a trendy club, the seating is limited, in this case to one communal high-top table and a line of bar-style window seating, both with stools. Good luck finding a spot, though. From the moment BLK MKT Eats opens at 11 a.m. and through lunch rush, those tables are occupied, with a line at least to the door, if not out of it. However, unlike the swanky bars in Miami, this is not an exclusive club. Set up like Chipotle, the workers behind the counter assemble items with impressive speed. They keep the line moving at an impressive pace, making it possible to be in and out with even a large order in no more than five minutes. Their quickness and accuracy are sights to behold, but the food proves equally impressive. One of the benefits to being so busy is that the seafood and vegetables at BLK MKT Eats are as fresh as it gets, short of growing or catching them yourself. 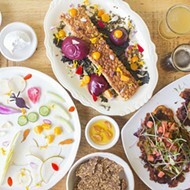 Like Chipotle and its many imitators, each protein/vegetable combination can be prepared in a few different styles: the sushi burrito, wrapped in nori and packed with sticky rice; a poke bowl, with either white or brown rice; an arugula-based salad; or atop wonton "nachos." You can't help but wonder how it took so long for the world to figure out the sushi burrito when you bite into the "Swedish Fish," a roll as colorful as it is delicious, filled with vibrant orange Scandinavian-cured salmon accented with yuzu dill slaw. Like all of the dishes at BLK MKT Eats, attention is paid to layers of flavor and texture — the pairing of silken fish with crunchy slaw and the way the dill and citrus infuse into the slaw's creamy base, evoking the classic pairing of salmon and crème fraiche. Snappy Persian cucumbers and full-sized asparagus sprigs add another pop of freshness, and a heap of avocado mimics the salmon's creaminess. The roll is so bright it makes your disposition sunnier. The "Tasty As Cluck" roll includes fried chicken, kimchi slaw, arugula, pickles, crispy shallots, tempura crunch and "OG Fire" sauce. The "Krilla Krunch" is BLK MKT Eats' answer to the beloved tempura shrimp sushi roll. Here, the shellfish is tender and fried almost to order so that the delicate tempura breading remains crunchy even as it's wrapped into the rice. Unagi slaw, Persian cucumbers, avocado, masago and tempura "crispies" complete this outstanding wrap. 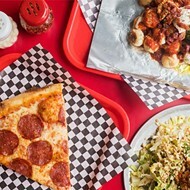 Fahrney and Turigliatto did not want to limit themselves to sushi, opting to include two chicken options for those diners who might not be into seafood. 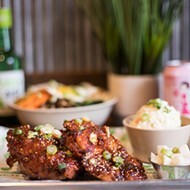 Their Korean-inspired "Seoul Delicious" features large hunks of tender grilled chicken enveloped in mouth-watering grill char. Mild kimchi slaw, carrots, pickles and crispy shallots garnish the meat; a piquant gochujang mayonnaise ties together the components, giving the entire wrap an undercurrent of spice. 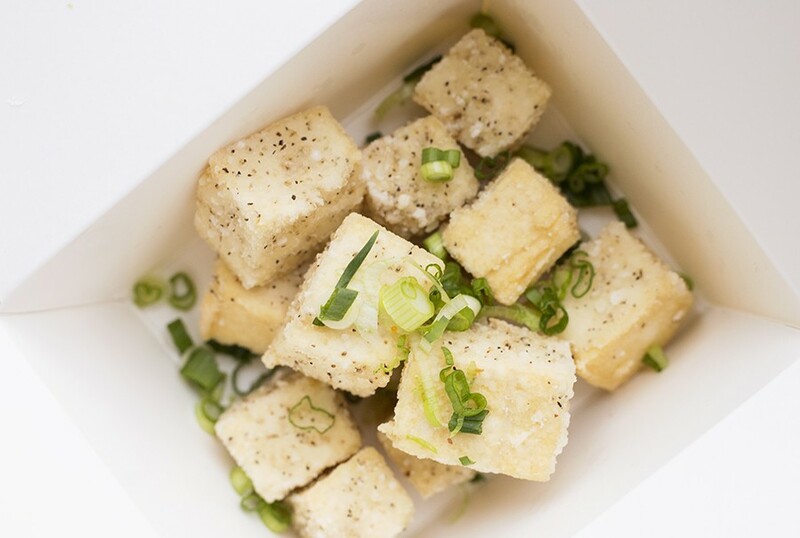 "Tofu nuggs" are a meat-free snack. The "Tasty as Cluck" is a nod to the American South, with buttermilk-fried chicken and pickles. 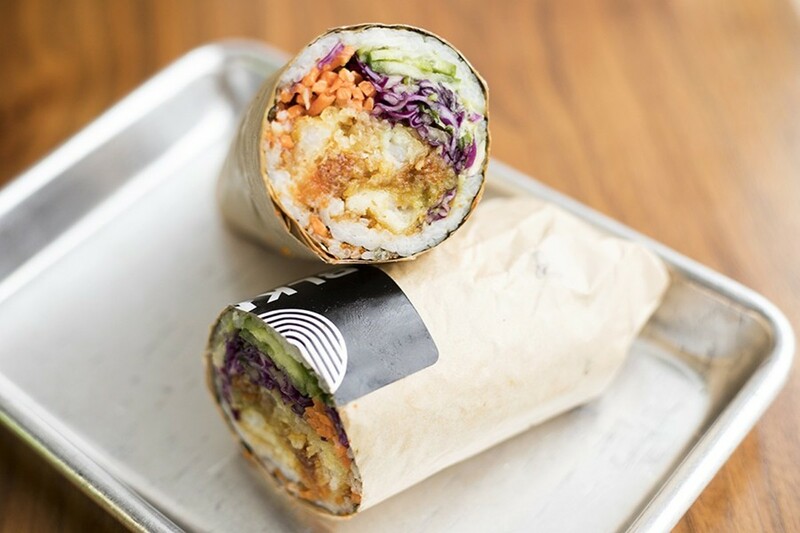 However, Fahrney and Turigliatto masterfully infuse the combo with Asian-inspired flavors, including crisp kimchi slaw, pieces of crunchy tempura batter and their signature "OG Fire" sauce, which is akin to sriracha mayonnaise. Forget what you've heard about fusion being a dated genre; this dish brings the idea into the 21st century. Though the sushi burrito is BLK MKT Eats' calling card, other preparations are equally enjoyable. The "Shaka Poke" seems tailor-made for a brown rice poke bowl. Cubes of garnet-hued, soy-slicked tuna rest atop a bed of Persian cucumbers, avocado, shredded cabbage and tempura crunch for a dish that incorporates two of lunchtime's biggest trends: the grain bowl and tuna poke. For the sake of this version, let's pray that this trend does not pass. The arugula salad option proved ideal for the "OG Fire," a mix of salmon (you can also choose tuna) and the restaurant's signature sauce that evokes the popular spicy salmon roll you can get at a sushi spot. Here, it's garnished with BLK MKT Eats' usual accoutrements (Persian cucumbers, avocado, masago, tempura crunch) though the addition of sliced jalapeños makes it searing hot. The "Shake Poke" nachos are a standout on a menu full of great things. In this parade of excellence, one item stands out above the others: The "Shaka Poke" nachos. Instead of tortilla chips, crispy fried wonton triangles provide a base to scoop up hunks of luscious tuna poke. The toppings take the "more is better" approach, as all good nachos do; these are covered with avocados, arugula, sesame seeds, shallots, scallions, tempura crunchies and a liberal garnish of the "OG Fire" sauce. It's a messy masterpiece — more Pollack than Michelangelo — though you won't mind wearing this art if that's what it takes. 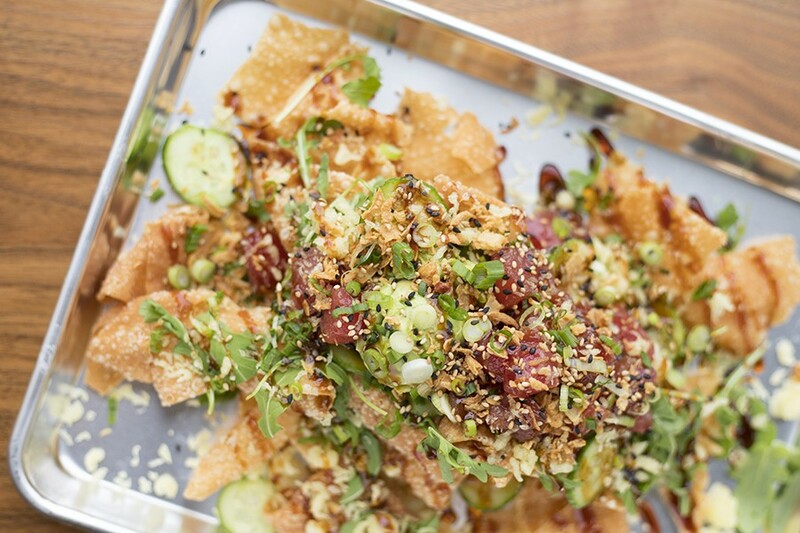 The "Shaka Poke" nachos alone could sustain a brand, but when you put them on a menu with one hit after another, it becomes clear that Fahrney and Turigliatto are on the cusp of what could be a major fast-casual chain. 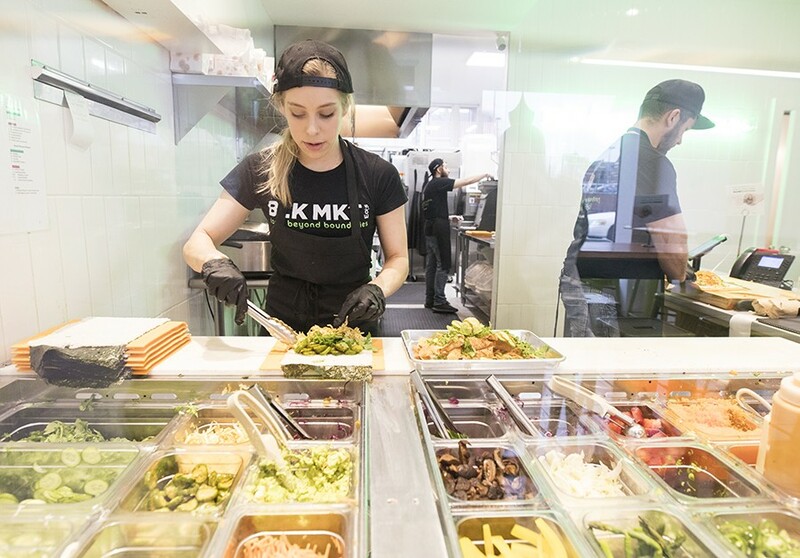 What makes BLK MKT Eats so impressive, though, is that the focus is less about rapid expansion and more on getting the quality right at what, for now, is its one and only location. It's a mixed blessing. 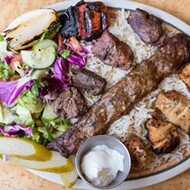 On the one hand, it guarantees us impeccable, quick-service food. On the other, it means standing in line and even driving crosstown to get our sushi-burrito fix. All good things in time — but with things this good, damn is it hard to wait.